He said the Prosecutor-General's Office was undermining reforms with its statement. US ambassador to Ukraine Geoffrey Pyatt has commented on the plans of the Prosecutor-General's Office (PGO) to check the use of US funds allocated to Deputy Prosecutor-General David Sakvarelidze. On 17 March, PGO prosecutor Vladyslav Kutsenko said at a briefing that a case was about to be launched over the fact that US funds for prosecution reform had not arrived at the PGO accounts. 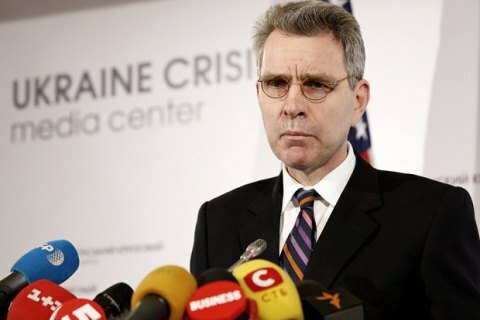 Pyatt tweeted that the funds were never meant to arrive at the PGO accounts. "U.S. doesn’t provide direct budget support to PGO or *any* UA govt institution/agency; funds go to credible int’l partner orgs. Example: U.S. gave $200,000 to the OECD (int’l recognized experts) to develop objective test for prosecutorial service. $2M in further PGO reform assistance is implemented by Int’l Development and Law Organization through @StateINL Same is true of U.S. assistance to patrol police, other judicial reform and rule of law projects," he tweeted. "As I’ve stated publicly before, we want to see PGO leading fight against corruption instead of openly & aggressively undermining reform," he concluded. The allegations of non-targeted use of 20m dollars allocated to develop tests for local prosecutors were first levelled by the PGO against Sakvarelidze on 12 August 2015. The USA responded by standing for Sakvarelidze and announcing plans to allocate 2m dollars more to support his efforts within prosecution reform.